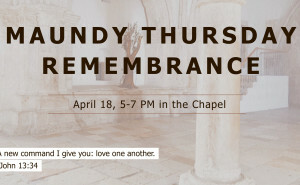 Maundy Thursday is a time of remembrance of the last supper Jesus had with his disciples and his command to love one another. This will be a time of prayer, receiving communion, and praparing your heart for Good Friday and Easter. Join us anytime between 5 and 7 PM in the Chapel and stay as long as you wish.